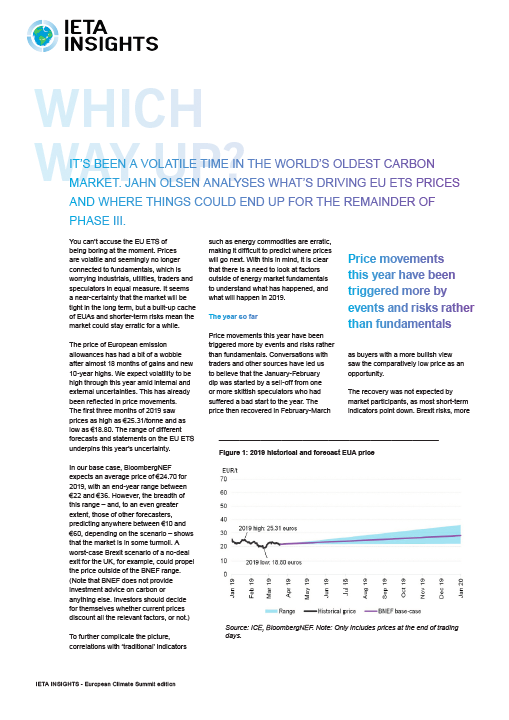 Prices in the EU ETS have been volatile in recent months. Jahn Olsen at BloombergNEF analyses what's been driving them and where things could head in the closing months of Phase III of the world's oldest carbon market. For more information on future articles or the end of year report, please contact Katie Kouchakji at kouchakji@ieta.org. Please contact Lisa Spafford for sponsorship opportunities at spafford@ieta.org. Synopsis: Can Article 6 benefit African Countries? 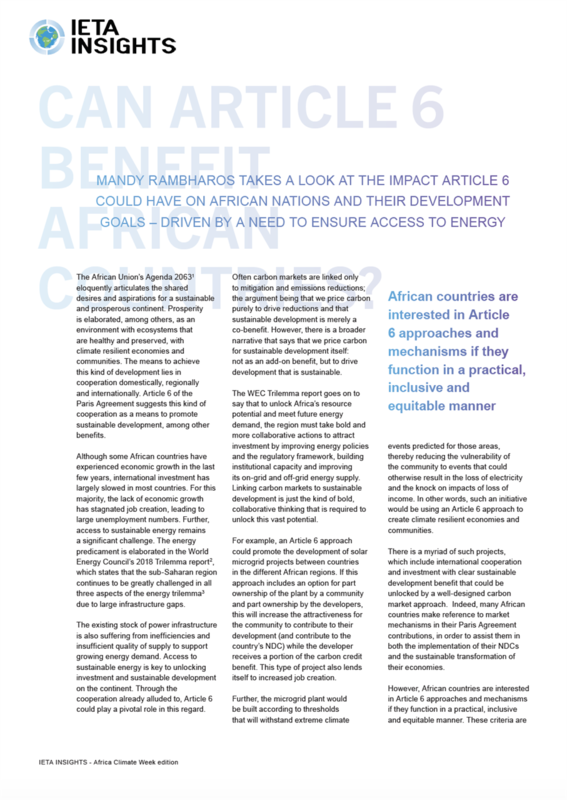 Prepared by Mandy Rambharos from Eskom, the article takes a look at how Article 6 can power sustainable development in Africa – a timely topic as Africa Climate Week gets underway in Accra, Ghana. We hope it gives you food for thought on how markets can drive the ambitions held by African nations and the role that international cooperation needs to play. The final edition of IETA Insights 2018 focuses on the Paris Agreement, the future of markets, and what carbon markets are achieving. IETA President and CEO Dirk Forrister spells out why guidance on Article 6 of the Agreement is crucial, while Alessandro Vitelli takes a close look at expectations for the EU ETS in 2019. ENGIE and Hydro, named industry leaders in RobecoSAM’s Corporate Sustainability Assessment, say how carbon pricing has changed their business. 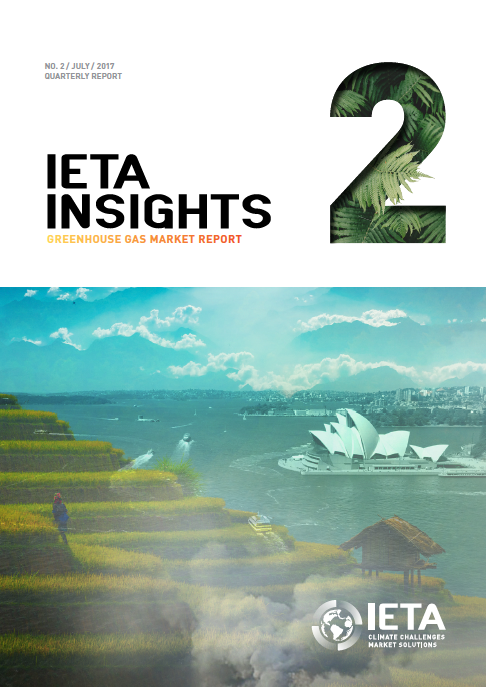 The second edition of IETA Insights 2018 takes a close look at activity across Asia Pacific, including an update on China’s ETS and why the region is vital for an impactful climate change response. Voluntary action is also in the spotlight, with an examination of how the Task Force on Climate-related Financial Disclosures recommendations are impacting business and how the voluntary offset market can help corporates raise their climate ambitions. For more information or content suggestions, please contact Katie Kouchakji on kouchakji@ieta.org. For sponsorship opportunities, please contact Lisa Spafford at spafford@ieta.org. IETA is proud to release the first edition of the IETA Insights for the year. For more information or content suggestions, please contact Alessandro Vitelli on press@ieta.org. For sponsorship opportunities, please contact Lisa Spafford at spafford@ieta.org. IETA is proud to release the final edition of IETA Insights for the year, rounding up all the developments from 2017 and looking at what will come in the next 12 months. The issue features an introduction by IETA President and CEO Dirk Forrister, a roundup of key market developments around the world over the year, prepared by the team at Carbon Pulse, and a preview of what to expect in 2018. Other articles include a close look at Singapore’s carbon tax proposal, the role for voluntary carbon markets in the Paris Agreement era, and how to build confidence in financing for REDD+. For more information or content suggestions, please contact Katie Kouchakji on press@ieta.org. For sponsorship opportunities, please contact Lisa Spafford at spafford@ieta.org. IETA is proud to release the 2017 COP23 edition of IETA Insights, profiling global climate action and the latest thought-leadership on Article 6. 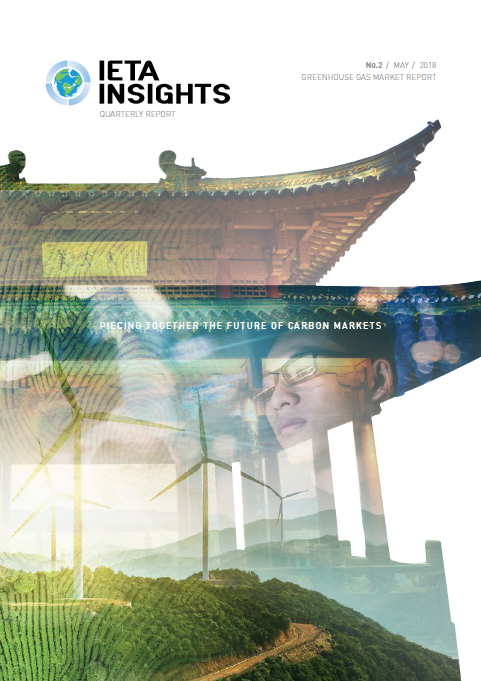 This second edition of IETA Insights shines a light on carbon market activity across Asia Pacific. Several initiatives are in place or preparation, including a national ETS in China which will be the world’s largest market – and which is featured in this issue. It also includes an article on what to expect in Phase 2 of the Korea ETS, the first cap-and-trade system for the region. 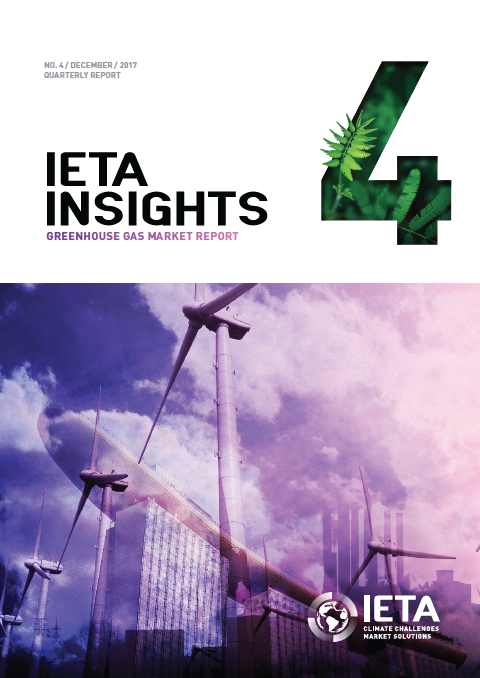 We are proud to present IETA Insights, our new quarterly report! Carbon pricing efforts are developing at a quickening pace around the world, spurred in part by the collaborative ethos of the Paris Agreement forged in 2015. Support for market-based measures remains at the core of IETA’s ethos, and IETA Insights will chart these developments and look at the innovative ways in which policies are enacted to suit national, regional and sectoral circumstances. 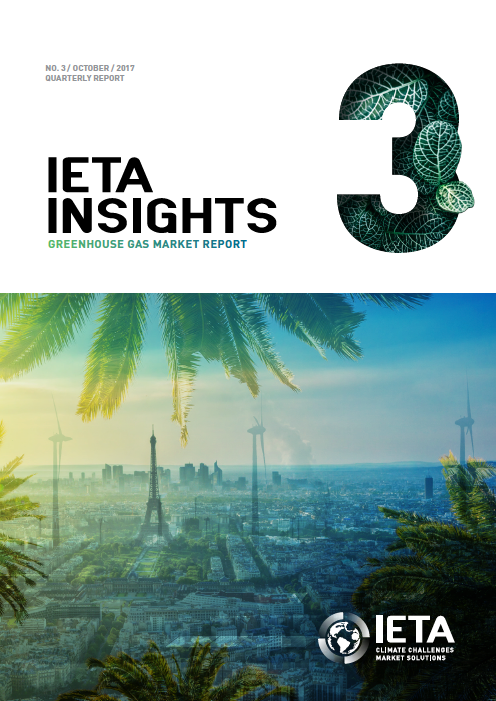 Published four times a year, IETA Insights will keep the business case for emissions trading in focus and expand the understanding of market-based policies to fight climate change. We hope you enjoy reading it, and always welcome your feedback – please contact Katie Kouchakji on kouchakji@ieta.org. For sponsorship opportunities, please contact Lisa Spafford on spafford@ieta.org. To read more about the GHG Market report, click here. 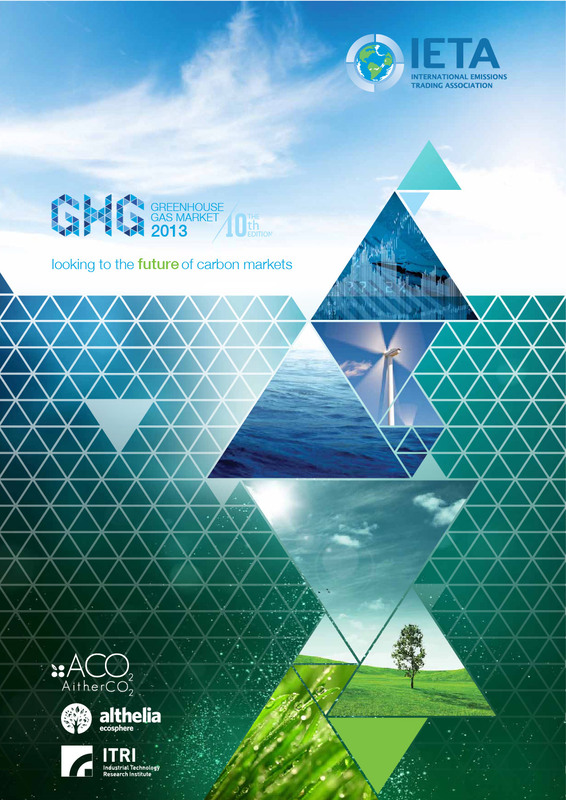 The GHG Market 2015/16 report went to press in early November, emphasising the theme of “Making Waves”. Our vision was positive, that messages emanating from Paris in support of carbon pricing could change the world. We stand in solidarity with those in Paris and around the world, mourning the events of 13 November. We intend to redouble our support for cooperation of governments and stakeholders to prove that dialogue and diplomacy are the strongest wave of the future, not violence and terror. 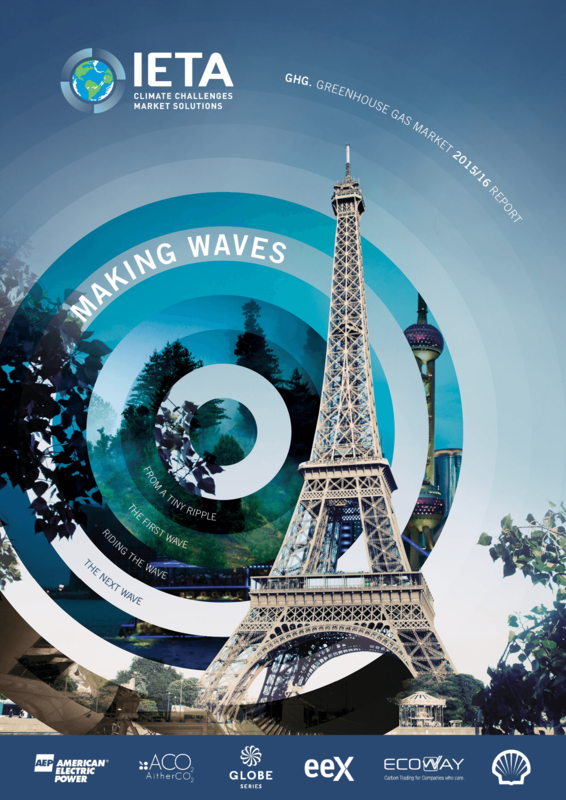 IETA is pleased to release the 12th Edition of Greenhouse Gas Market Report, entitled Making Waves. If you have any questions about the publication, please do not hesitate to contact Katie Kouchakji (kouchakji@ieta.org). 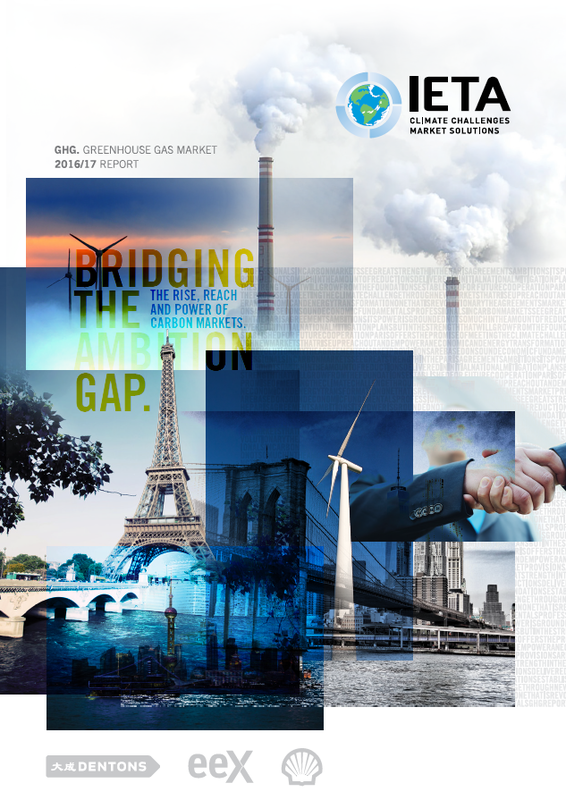 IETA is pleased to release the 11th Edition of Greenhouse Gas Market Report, entitled Markets Matter. The publication brings together carbon market professionals, policy-makers, academics and NGOs to provide in-depth analysis and perspectives on the main issues affecting carbon policy worldwide – including a scene-setter by UNFCCC Executive Secretary Christiana Figueres. IETA is global in its outreach and the publication features latest developments and best practice in current and emerging carbon markets, as well as taking a step back to consider the wider implications of climate policy design and implementation. This year’s report is structured around three main themes where markets matter: climate finance, low-carbon technology and emissions trading. IETA expresses its gratitude to all authors who have contributed to this publication, to the editorial committee, and all others who have worked on the publication. IETA would also like to thank our sponsors, AEP, AitherCO2, EcoWay and EEX. 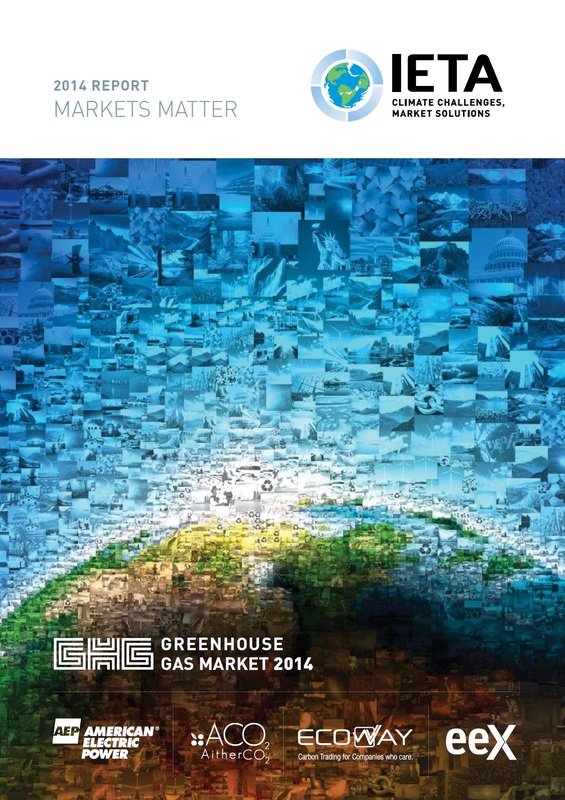 IETA is pleased to release the 10th Edition of Greenhouse Gas Market. The publication brings together carbon market professionals, policymakers, academics and NGOs to provide in-depth analysis and perspective on the main issues affecting carbon policy worldwide. IETA is global in its outreach and the publication features latest developments in current and emerging carbon markets, as well as taking a step back to consider the wider implications of climate policy design and implementation. IETA would also like to thank our sponsors, AitherCO2, Althelia Ecosphere, and the Industrial Technology Research Institute (ITRI). If you have any questions about the publication, please do not hesitate to contact Jeff Swartz (swartz@ieta.org). 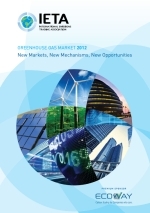 The International Emissions Trading Association (IETA) is pleased to release its annual flagship publication, IETA Greenhouse Gas Market 2012, sponsored by EcoWay,on October 1. 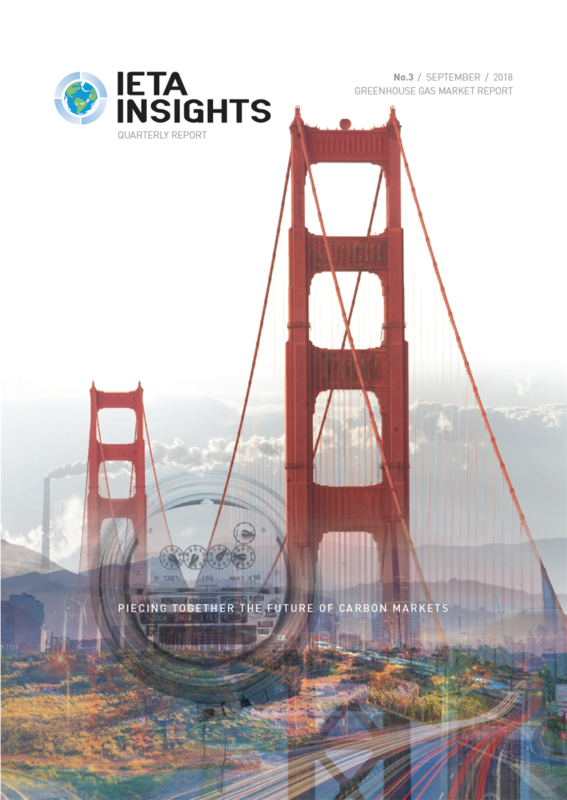 The publication is a comprehensive guide to the latest developments in global carbon markets, bringing together market specialists in a series of expert contributions. This year's publication features over 30 articles addressing a wide range of pertinent issues affecting global carbon markets. Contributors come from a range of perspectives, including industrial, legal, multilateral, financial, diplomatic, academic and non-governmental sectors. 2012 has seen a continued expansion in global carbon markets despite difficulties in core markets in the European Union and the Kyoto Mechanisms. New cap-and-trade programs are emerging, particularly in the Pacific Rim region, as nations embrace the use of market-based mechanisms to reduce emissions. Meanwhile, the UNFCCC is concentrating on the development of a new market mechanism to compliment the existing CDM and JI mechanisms. Alongside this, the Green Climate Fund (GCF) considers avenues and instruments for catalyzing investment in climate finance. Additionally, new technologies such as CCS, and new sectors such as REDD+, continue to be explored at the international level as possibilities for facilitating emissions reductions. 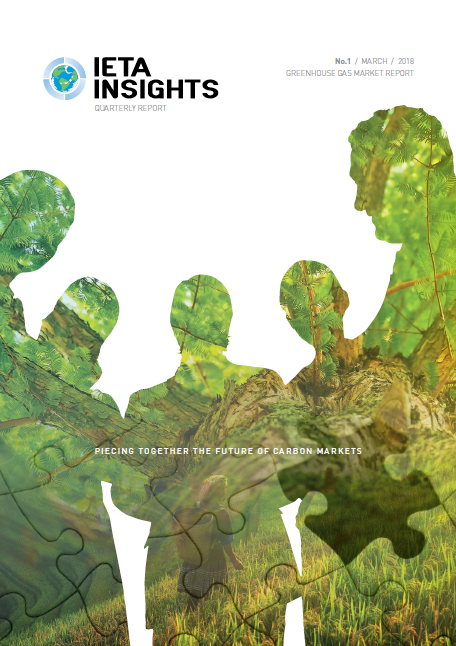 This 2008 GHG Market Report, titled “Piecing Together a Comprehensive International Agreement for a Truly Global Carbon Market”, covers a range of topics and regions that is more comprehensive than ever before. Articles in this year’s Report demonstrate how emissions trading systems are not only spreading out across the globe but are also increasing in scope as new sectors and gases are brought into the fold. There is something for everyone in this Report; it includes the most comprehensive coverage of issues of immediate interest that IETA has been privileged to bring together in one publication. The issues discussed reflect the immense experience and enlightened viewpoints of the IETA membership and a few invited guests who agreed to share their special knowledge. These authors dig far into the development of emissions trading around the world, to explain what is most important for businesses as well as policymakers. 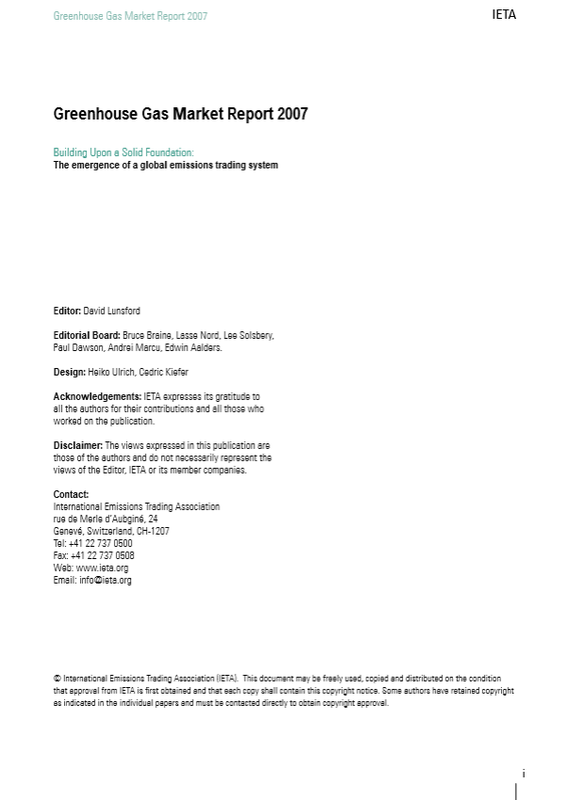 The 2007 GHG Market Report, titled “Building upon a Solid Foundation: The Emergence of a Global Emissions Trading System”, covers a wide variety of topics and regions, which signify the proliferation of emissions trading as a central tool while putting in place global measures to combat climate change. Articles in this year’s Report cover the development of emissions trading systems spanning the globe. The papers in this publication reflect the experiences and views of our membership authors, reflecting upon their insight on the development of emissions trading around the world. They tell the story of prevalent growth and evolvement, promising to shed new light on the global GHG marketplace. 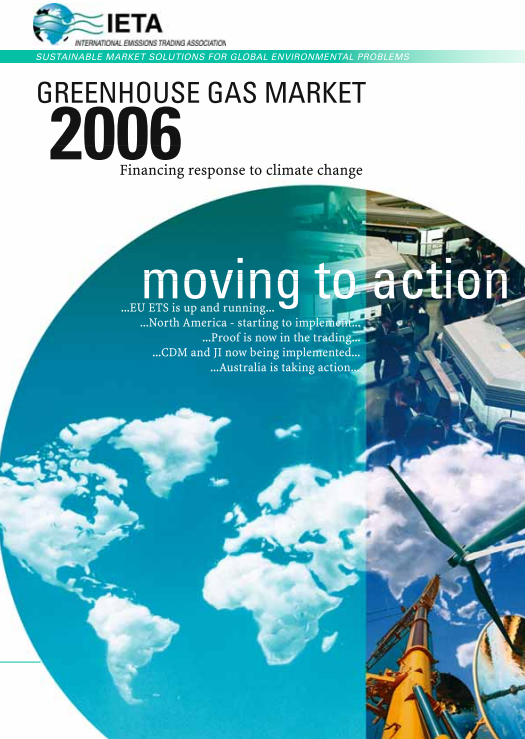 The title of the 2006 GHG Market Report, “Moving to Action”, illustrates well the stage of development we have reached in the GHG market. 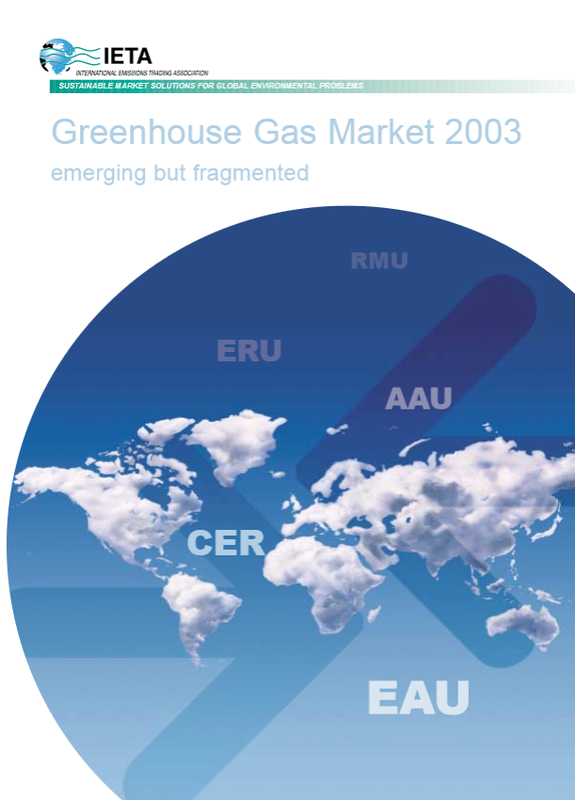 The market has grown rapidly in 2005 and first half of 2006 both in terms of EUAs and CERs traded. It responded well to the signals it received, especially during the release of verified data in May 2006 when we saw significant price variability. The papers in this publication reflect the experiences and views of our membership authors – sharing with you what has happened in 2006 and what they see as the future. They tell the story of growth both in terms of experience and the size of the market and as such provide a unique and interesting perspective. 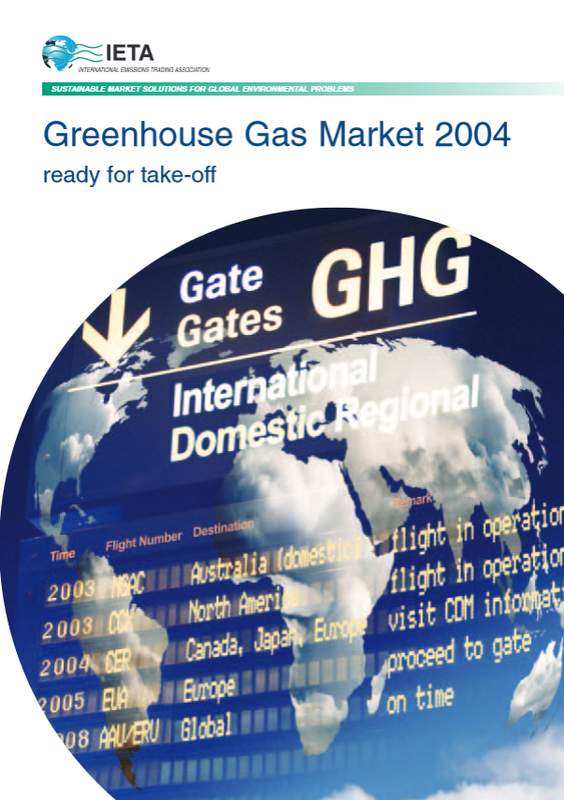 The 2005 IETA GHG Market Report was issued at COP/MoP 1 in Montreal. 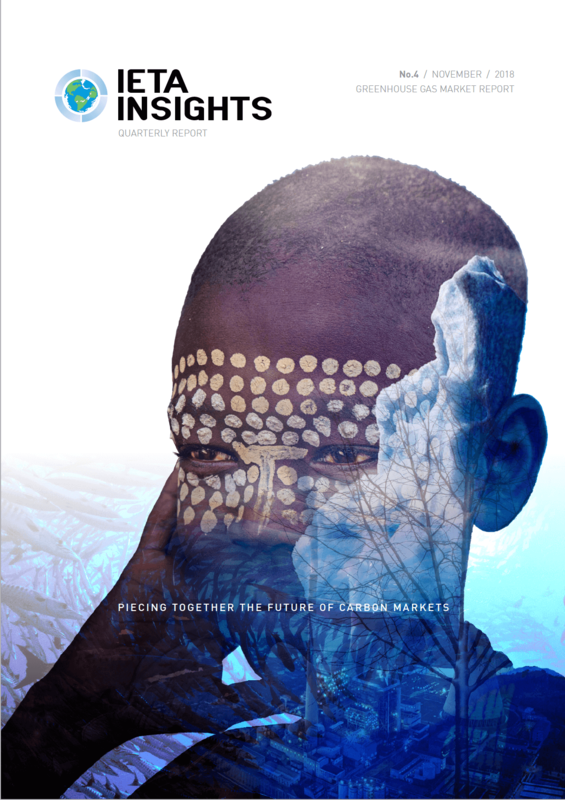 We hope that this publication provides a good overview on how the market has developed over the last year. At the same time, COP/MOP1, as the first Meeting of the Parties to the Kyoto Protocol, represents an important milestone in the process of addressing climate change. Negotiations related to the Kyoto Protocol and Marrakech Accords have been largely completed and all stakeholders need to examine how well the current instruments, including market approaches, have served it before engaging in the debate to design the post 2102 architecture. Emissions trading has taken off this year following the ratification of the Kyoto Protocol by Russia and with the introduction of the European emissions trading system (EU ETS). Although the CO2 market is growing fast, it remains narrow compared to others. Nevertheless, it is beginning to play a role as an instrument to promote economic and environmental efficiency in the fight against climate change. Our main regret for this year is the slow progress on the Clean Development Mechanism which could provide such an incentive to invest in greening the development path of many of those economies whose emissions are growing fastest. We believe that bureaucratic obstacles, often put in place with the intention of ensuring rigour, but resulting in paralysis, are the main problem. IETA has put forward a series of ideas to improve the situation that we hope will be implemented next year. For our 2004 Market Report we chose the title "Ready for Take-Off" a few months ago, and it turned out to be a fortunate choice. The GHG market "world" has once more changed. President Putin's signature is now all that is needed to bring the Kyoto Protocol into force. From a GHG market point of view what this brings is the increasing certainty that the market derives from the global agreement that underpins the EU commitment, as well as current Canadian and Japanese efforts in the market. CDM and JI and their products look more certain. Activity in the GHG market has increased, not only in Europe where the start of the EU ETS is around the corner, but also in Japan, whose business community has become the biggest purchaser of CDM credits. There is enthusiasm in the market with the volumes increasing rapidly, new entrants from the financial sector and exchanges being created, indices coming on line, multiple master contracts being reconciles to increase liquidity. Challenges remain. In North America, the Canadian Large Final Emitter program is still being developed. In the US the North East states are developing their program wile other programs are actively pursuing efforts for cross recognition. We will continue to work and provide our support to the CDM EB to ensure that it fulfills its promise. The shape of the EU ETS during the second allocation period will require learning from what we have done so far. As IETA we must be proud that we are playing an active role, that we have become recognized as a valid, thoughtful and credible voice of business, one that has environmental credibility. The 2003 edition of the Greenhouse Gas Market is the first time IETA is undertaking such an ambitious project.We hope that this document will provide insights and perspectives that will benefit all those who work to ensure that market mechanisms are an important part of the solution in addressing the challenge of climate change. 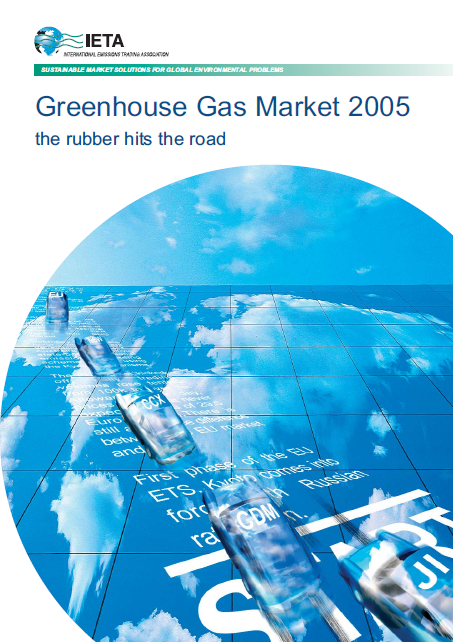 The Greenhouse Gas Market 2003 represents collective views of those who have worked in this market in 2003.Their conclusions are based on hands on experience in developing projects, interacting with regulators, developing new protocols and products. The articles included cover a broad range of regions and topics. The GHG market is only emerging and in selecting submissions we tried to illustrate the richness of experiences, views and approaches that we see around the world. As this is the first effort for this publication,we look forward to your comments as to what you found useful, what worked and what did not.